The month after the September 11th terrorist attacks, my wife and I decided to visit the harvest festival at Cox Farms in Virginia. She’d heard about it from our neighbors so we took a Saturday to see what it was all about. It was a windy fall day with clear skies, and the festival area was already busy when we arrived. From the parking lot, we walked through the entry gates into an open, gently sloping area bordered by corn fields. Pumpkins, straw bales and gathered cornstalks decorated everything. 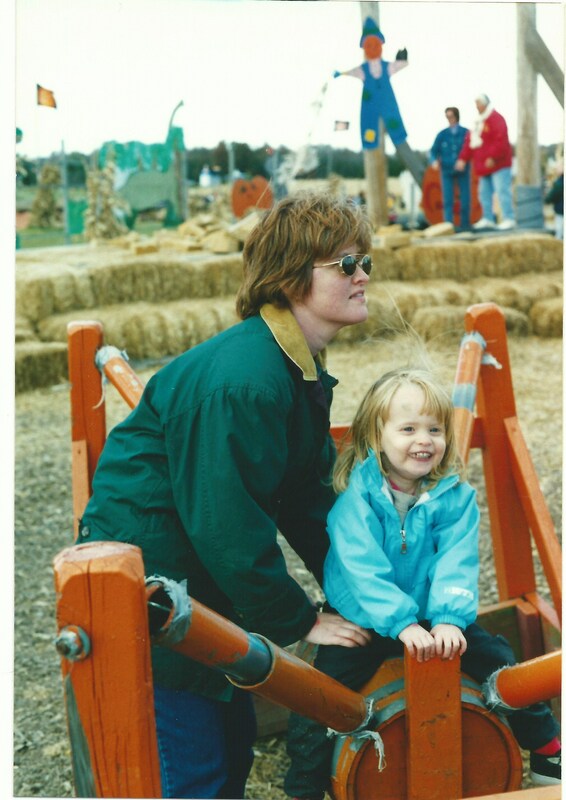 My wife and daughter at Cox Farms in 2001. I carried our younger child, not quite one year, in the carrier backpack. He was bundled too and hunkered down against the wind. He peered out at the activity around him but seemed content to stay in his nest. Our daughter next wanted to try the long slide. Built into the side of a slope, I thought it would be daunting to a small child but she was game. At the bottom we waited and as she slid to a stop in the soft straw, she looked as if it were a bit much. “Would you like to go again?” I asked. “No,” she said. So we moved on to the next thing. My wife and I had come to Cox Farms that day looking for something. It had been a rough year for us. Our son had been born through an emergency caesarian section when my wife had suffered a ruptured aneurysm while pregnant. The subsequent brain surgery, while saving her life, caused trauma that required months of rehab and supervised care. And all while we tried to raise two small children. The aneurysm was an event that divided our lives into “before” and “after,” a clear marker that separated what we wished for our future from what was now actually achievable. The brain trauma also created a separation between “us” and “them”—those who understood what brain injury was all about and those who could not. These twin difficulties worked in tandem to create a feeling of isolation for us. And the September 11th attacks only added to our desire to find connection with others and with a normal flow of life. But we didn’t find it that day, nor for several years to come. The loss and the resulting loneliness were with us constantly, a formless presence that acted out when least appropriate, seeping into our daily routines and interactions. It seemed to live in our bones.